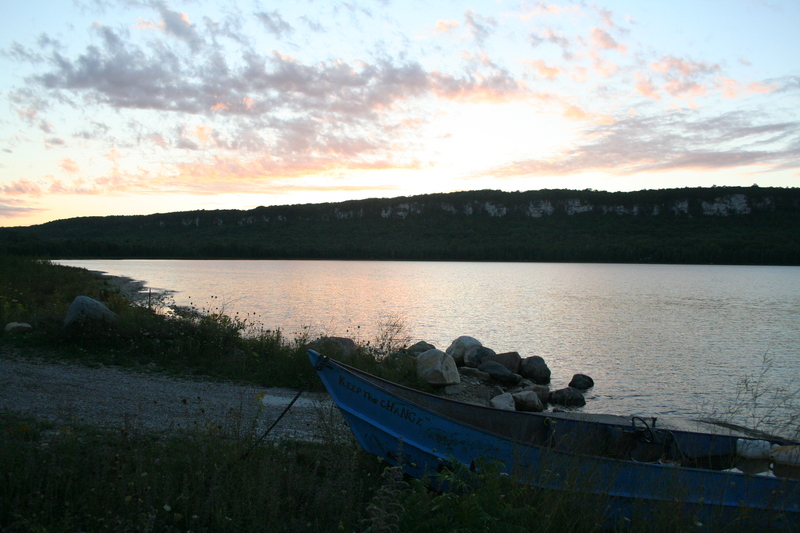 Yoga takes your mind to peaceful, beautiful places like Cape Croker, Ont. I took this photo on Aug. 17. Hanging upside down and bent deeply into a downward dog stretch, I saw it: the first bead of sweat trickling down my sizzling arm. From there, it was like a tap turned on. My pores were seeping liquid, unrelentingly dripping on my sticky mat. At first. it felt disgusting. Then, strangely, good. 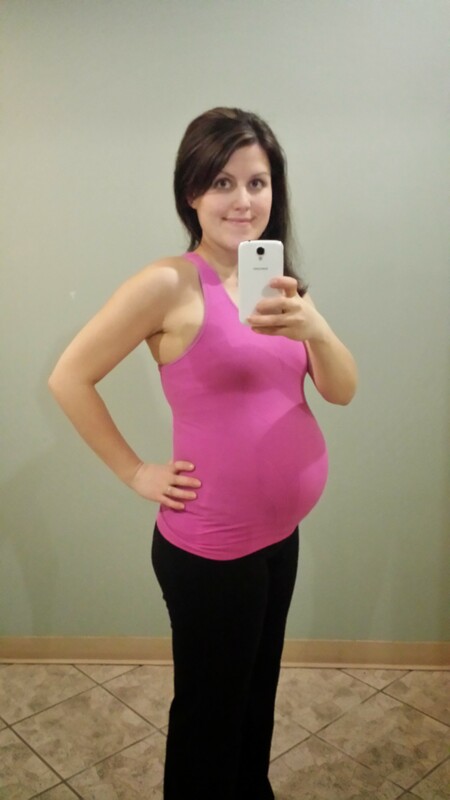 It was my first hot yoga class – or heated Vinyasa, to be precise. I have practised various forms of yoga in the past, but I haven’t taken a regular class for the last few years. Instead, I have been focusing on running and other forms of cardio. But, obviously, yoga has some major benefits – for runners, and for everyone. After doing a yoga class with my mom and my sister last week (a couple days after my half-marathon), it was almost like a healing experience. Every sore or tight muscle was stretched and relaxed. Clearly I need to bring yoga back into my life. Saint John blogger Barb Crawford has made practising yoga three times a week a goal for her #30in90 challenge. So I asked to hitch a ride with her to Rothesay this week to the Yoga Haus. At first, the heat is uncomfortable. But after a while, it’s like being wrapped in a warm blanket. Heated yoga has many supposed benefits, including allowing deeper and longer stretches, which in turn helps build muscle and burn more calories. The heavy sweating is also said to provide “detoxifying” effects, and the practice helps bring mental clarity and ease stress. Hot yoga students are advised to avoid heavy meals before a class and drink as much water as possible. But hot yoga – one popular kind is called Bikram yoga – is not without its critics. Some scientists question the ability for the body to “detoxify” by sweating copiously. “As a scientist, I wouldn’t say there’s a huge stock in sweating out your toxins,” Stephen Cheung, the Canada Research Chair in Environmental Ergonomics, told the Globe and Mail last year. The body only releases toxins through sweat to a very limited extent, he said. The extreme temperature and humidity in hot yoga can be risky for those with heart conditions, or for people with high blood pressure. Cardiologists have raised concerns about dizziness or blackouts from the extreme heat. This does worry me a bit, and I could see how it could happen if you were not prepared. But as my friends advised me, I drank a ton of water (probably about three litres) leading up to the class. I ate a banana and nuts in the mid-afternoon so I wasn’t starving before the 7 p.m. class. And, I am in decent shape so the strenuousness of the increased heart rate in the heat didn’t shock my system. For me, the most pleasant part of hot yoga was the after-effects. I went home feeling cool and calm, even though I was soaked right through my clothes. I felt pleasantly tired, and I really felt like I had a good workout (unlike some yoga classes that feel more like a nap). I had the best sleep in weeks, and woke up refreshed. My muscles felt worked, yet, good – tingly and happy almost, if that makes any sense. Most of the muscles (hips, knees, hamstrings) that often bug me from running felt excellent after the class. I paid $20 for an unlimited pass for the next week, so I’m hoping to get in as many classes at the Yoga Haus as possible. I would definitely like to make hot yoga a regular part of my weekly routine. Who knew sweating could be so much fun. It’s so simple, yet so easy to forget. Breathe in, and out, and that’s really all there is. Yoga in the White Room. That's me on the bottom left, with a black racer back top on. 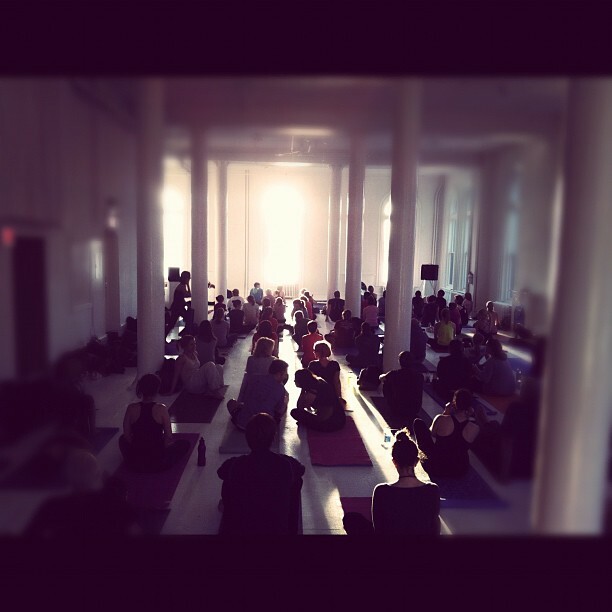 The feeling of doing yoga, breathing in and out deeply into stretches and poses with at least 100 other people that evening was incredible. It was grounding and strengthening. As the class began, it was bright and sunny. As the class progressed, the sun delicately set over the Saint John harbour. The collective aura was so positive – one reason why I always enjoy group classes, whether it’s spinning at GoodLife or a boot camp class with the folks at Simply For Life on the west side. In my drive to improve my health and fitness, which has actually become a fun challenge for myself, it’s easy to forget that part of that challenge involves taking a breath, and being in the moment. This simple necessity is so easily overlooked when I’m busy trying to burn as many calories as possible on the spin bike or on the treadmill, or planning my next meal (or treat). I love how running and exercise can chase away the stresses of life, but sometimes, I think “breathing into” those stresses, as a yogi might suggest, is just as important.